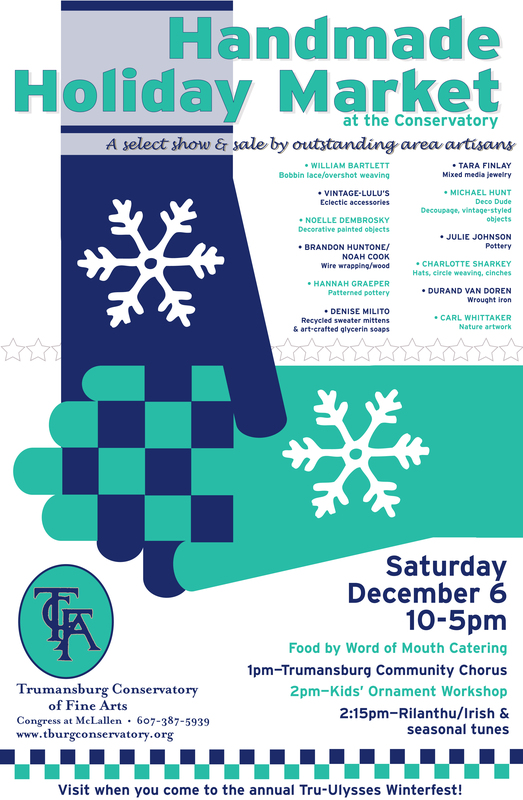 TCFA is pleased to present again the Handmade Holiday Market on Saturday, December 6, 10-5pm. Held concurrently with Trumansburg’s annual Winterfest, this market will feature a dozen high-quality artisans, showing beautiful work ranging from pottery and jewelry, to bobbin lace and overshot weaving, fiber apparel, ironwork, woodworking, electic vintage-inspired accessories and more. An Ornament-Making Workshop for Kids will be presented at 2pm. Live music will be provided by the Trumansburg Community Chorus (1pm), by Rilanthu (2:15; Irish & seasonal tunes), and delicious, simple food, made by Trumansburg’s Word of Mouth caterers, will be available. William Bartlett (bobbin lace, overshot weaving); Noelle Dembrosky (decorative painted objects, paintings); Tara Finlay (mixed media jewelry); Hannah Graeper (pottery); Michael Hunt/Deco Dude (decoupage, vintage-styled objects); Julie Johnson (pottery); Brandon Huntone (wire wrapping); Noah Cook (woodwork); Mark Oros (stonework, jewelry); Denise Milito (recycled sweater mittens, glycerin soaps); Charlotte Sharkey (fiber/weaving, hats, cinches and more); Durand Van Doren (forged iron); VintageLulu’s (eclectic accessories); and Carl Whittaker (nature artwork).